The myth by Christopher Clark that England “sleepwalked” into WW I  is put to rest by Helmut Roewer, who has analyzed the pre-war diaries and letters of war instigators Herbert Asquith and Lloyd George (PM and FinMin in 1914) . Roewer considers Germany’s large merchant fleet the key factor – by 1914 both Hamburg’s HAPAG and Bremen’s Norddeutscher Lloyd became 4 to 5 times bigger than the largest English shipping company . When asked during a presentation however, if an English shareholding of up to 50% in these companies could have prevented the war, he gets defensive and even lauds HAPAG’s closed shareholder structure . Amazing, how traditional attitudes prevail in some people. What could have been prevented and what achieved if we had had an Anglo-German Co-Creation process in the 1890s? Co-Creation is an appreciative process of collaboration. It can be used in all creative areas. Co-creation successfully overcomes the emotional impression of separation and fear and replaces it with unity and love. Let’s start a Blitz of the hearts! Let the lobbyists and foreign ministries in London, Berlin, New York, Washington, Beijing and Moscow become global centers of co-creation! Moscow / Warsaw / Berlin, Easter 2016. To love your fellow man more than yourself, namely to love your fellow man as Jesus Christ has loved them, was the final order, the Savior gave his disciples at their last supper. It has only now become known that Jewish officials in the United States, Israel, and Germany have taken this advice to heart – and have for years downplayed the number of Jewish victims in the 20th century – without making a big fuss. The total number of Jewish victims was reduced from 18 million to 6 million. The true number however remains evident and the arithmetic irrefutable. they refuse to become members of the Greek Church, but prefer to remain Jews. To carry out this purpose, it has used several methods. Wholesale assassinations (called pogroms), have been employed in order to arouse the religious fanaticism, the greed, and the savagery of the needy, the ignorant and the depraved among the Russian people. The annihilation of the six million Jews now congregated in the Russian domains goes on in a well defined and systematic manner. 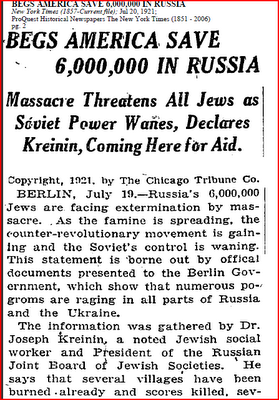 Russia’s 6,000,000 Jews are facing extermination by massacre. 127,000 Jews Have Been Killed and 6,000,000 Are in Peril. […] 6,000,000 souls in Ukrainia and in Poland have received notice through action and by word that they are going to be completely exterminated – this fact stands before the whole world as the paramount issue of the present day. Forgiveness and gentleness of Jewish officials in the United States, Israel, and Germany are the very happy Easter message of 2016. 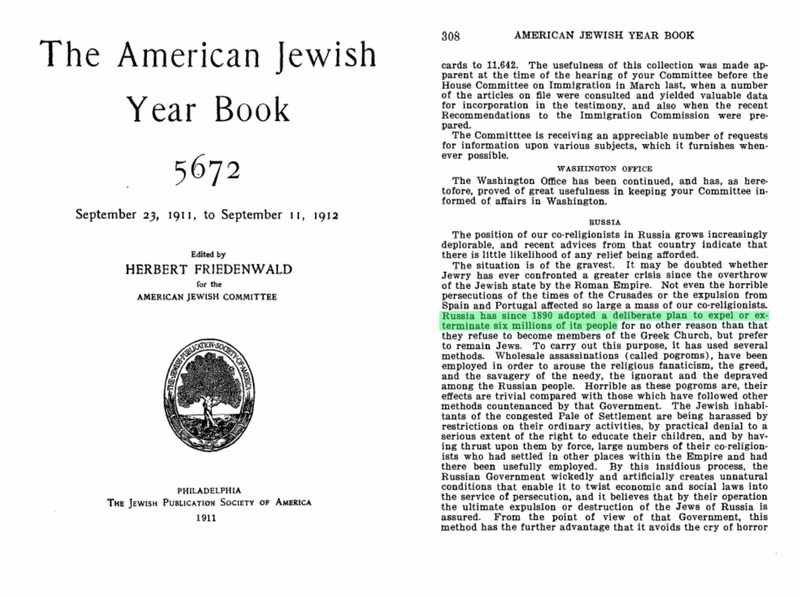 With modesty and in silence they have reduced the 18 million Jewish victims in the 20th century – 6 million in Tsarist Russia + 6 million in Eastern Europe between the wars + 6 million in the German sphere from 1933 – to 6 million. The world can now see that today’s Jewish officials are poles apart from the fury and intolerance of High Priest Caiaphas and the mob of Jerusalem. This is a translation of the second open letter published in Epoch Times on 9 October 2015. The first open letter of 21 September 2015 will be translated later on. See Schultze-Ronhof’s bio at Wikipedia [German]. By Gerd Schultze-Rhonhof, Gastautor, Friday, 9 October 2015 1:17 p.m. (c) Epoch Times. In February 2015 six Stalingrad veterans have sent an open letter to Mrs. Angela Merkel: Russian, German, English . A reply: German.